The Secretary of State of Defence, Júlio Tomás Pinto, visited Portugal, in the beginning of January, where he established contacts for Timor-Leste’s integration in the Portuguese Peacekeeping Force in Lebanon. “Timor-Leste would like to participate in the Peacekeeping Operation in Lebanon. We cannot forget that after the referendum the international community contributed – and still contributes – strongly for the peacekeeping mission in Timor-Leste. Thus, in the quality of a sovereign country and conscious of the importance of peace and stability, at a regional and international level, Timor-Leste feels an obligation to integrate this United Nations mission in Lebanon” explained the Secretary of State of Defence, Júlio Tomás Pinto. The proposal was well accepted by Portugal, where the General-Director for National Defense Policy, Luís Faro Ramos, stated that given the experience in matters of peacekeeping missions, Portugal accepts the F-FDTL members’ integration in its Contingent. The Portuguese Secretariat of State of National Defence and Sea Issues will now send an official letter to the Timor-Leste Minister of Defence and Security, Kay Rala Xanana Gusmão, to formalize the Timorese military’s integration in the Portuguese Contingent in the Lebanon Peacekeeping Mission. 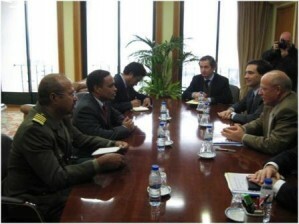 The Portuguese authorities also manifested their intention to continue supporting Timor-Leste.